Topic: Replacement Battery Options for 2012 i-MiEV? Re: Replacement Battery Options for 2012 i-MiEV? I'm fairly sure that mmcmanuals site is a copy of what is on the imiev service manual disks, adapted to not require internet explorer and be compatible with other browsers. I mucked around with the disc files bit and got pages very similar to what is up there. hmm... Depends on what it does above that value.... if it overflows to the negative it would certainly give the fuel gauge and guess o meter a hard time. But it might still drive OK until it hits a voltage limit? Best commute to work I've had in a while this morning! Also I have a pretty good handle on how I'd go about replacing the cells, after seeing the way the pack goes together. But i think I've learnt enough to fix it all myself now! Also found the charger is significantly cheaper at amayama! We've successfully repaired the pre-charge circuit by fitting a 22Ω 200W resistor. We initially ordered a 50W unit, but it just looked physically less robust than the manufacturer part. The car is now charging again. After a few wrong turns and detours our imiev is now fully charged again! Hurrah! 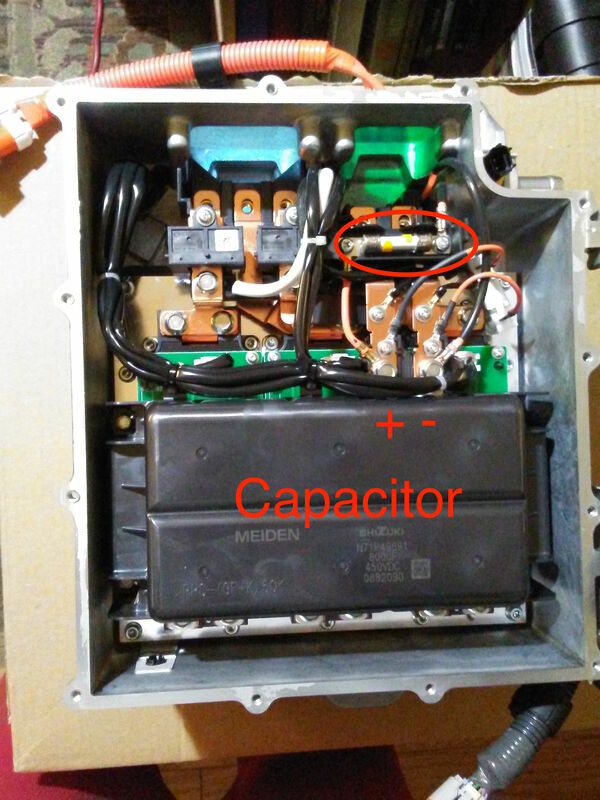 Without the detours we needed to replace two capacitors in the charger, and the on board charger (OBC) fuse in in the motor inverter. Knowing what I now know it should be a weekend job. I'm familiar with resistor colour charts, but is there some kind of reference for numeric codes? I'm sure I've seen ceramic resistors with the actual values written on. The grey stuff was like mortar - probably a good thermal buffer. We identified a ground fault in the DC-DC converter, which could have drawn a bit through it. But I can't figure out is the 240K a model number? Or is there some kind of Roman numeral notation going on here where the K cancels out the zero? I've got some imagery of the capacitor. I believe it reads 8000F, but it's a bit unclear, it could be 800uF. On the video at https://youtu.be/VsYd4NXaMpo they replace a single cell, with what looks like a drop in replacement.